Sudoku is a Japanese word and is short for suuji wa dokushin ni kagiru, which freely translates to the numbers must be single or alone. The puzzle has been made popular in Japan around 1986 by a company named Nikoli. Even though it first became popular in Japan, the puzzle is probably not a Japanese invention. The first sudoku in it’s current form is believed to be published in 1979 in Dell Magazines under the name Numbers Place. The inventor of Numbers Place is Howard Garns a retired architect and freelance puzzle designer. He died in 1989 before seeing his invention becoming popular throughout the world. This happened around 2004 when The Times and a local US newspaper started publishing sudoku’s on large scale. This was possible due to an automated computer program which could produce sudoku’s, written by Wayne Gould. After this, more and more newspapers throughout the world started publishing the puzzle and the worldwide trend became a fact. Similar puzzles, as in puzzles that use numbers and a grid, date back to as early as 1892 in a French newspaper. 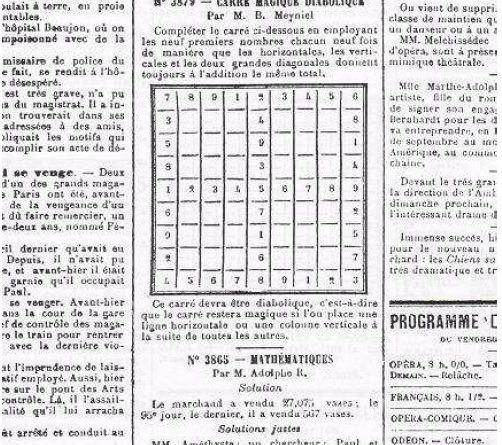 In 1895 another French newspaper starts publishing puzzles that already come pretty close to the currently known sudoku although it doesn’t has the exact same characteristics.